It doesn't always refresh as quickly as possible - especially if location services aren't on for the weather. It's not false weather conditions though. Mines accurate right now. Perhaps there hasn't been a proper update in your region. Are you talking about in the app or in the status bar? 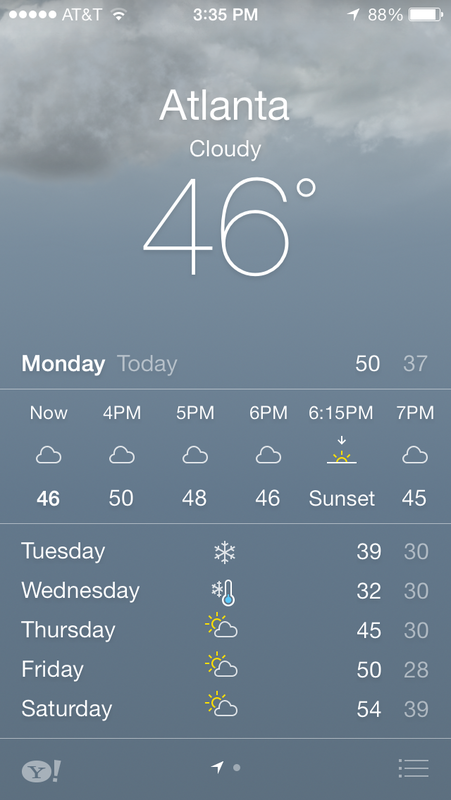 To add...in the swipe down notification center, the weather is identical to the above information. Your making me jealous showing off that type of weather. its currently -8 Fahrenheit here in Canada. Yahoo weather very inaccurate in Canada so it's not surprising. It's 18 where I'm at in the mid-West. 46 sounds nice. The weather app seems to work fine here.